The cat who clawed his way out of the grave where he was buried alive will not be returned to his former home, rescuers say. Bart's owner, Ellis Hutson, reportedly found the cat lifeless in the road after he was hit by a car, and enlisted a neighbor to help bury the dead feline. But a newly uncovered video, in which a witness says Bart was still moving, has cast doubt on that claim, says Sherry Silk, shelter director at the Animal Health Center at the Humane Society of Tampa Bay. "If somebody tells you the cat is still breathing and it's alive, the cat shouldn't have been buried," Silk told news station WFTS. "I don't know if it was purposeful, but we are not going to return the cat to him." 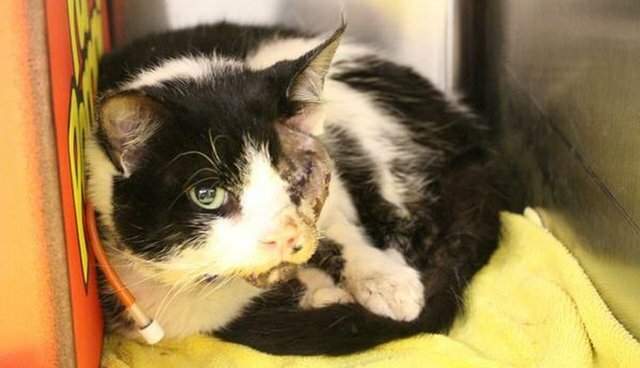 Bart is said to be resting comfortably following surgery to repair broken bones and a damaged eye at the Animal Health Center. Still, he's at a delicate stage of recovery and may require a feeding tube for the next several weeks. Silk previously told The Dodo that it was "miraculous" he had survived at all. Hutson told the news station he's done nothing wrong, adding that he is willing to take the shelter to court to get Bart back. Still, the Humane Society is unswayed. "We are prepared to fight for the best interests of this cat," the shelter writes on its blog. "We hope the Hutson family will do the right thing and surrender Bart to our care so that we can find an appropriate environment for him to live out his life."